At Get West, we believe that a hen or stag party should be an adventure. We can provide your party with the action it needs to get off to a roaring success! Whether you’re looking for some simple water fun or a weekend packed with activities, there’s something here for everyone. So round up the lads or lassies, and find your adventure! 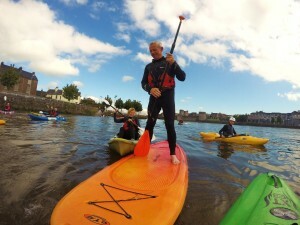 Journey through the historic heart of Limerick City, on your very own sit on top kayak (or stand up paddleboard). Along the way, you will take part in fun-filled activities and challenges, guaranteed to have everyone smiling and laughing. The adrenaline junkies among you then have the option of jumping off the pier into the mighty River Shannon. You’re guaranteed to be talking about this day out long after the dust has settled. Great craic and everyone is sure to be in high spirits for the night ahead. We offer this package in Limerick, Galway, Athlone and Carrick on Shannon. Minimum group size is 10 people. Get West can cater for smaller groups but the cost per person is more expensive. For further info or bookings, please use the contact form below.